Last Saturday I shoved 17 lakh in my pocket and went out in Peshawar to buy market hot Aqua. Drove complete University Road and Ring Road and visited almost 15 showrooms to select Aqua. Finally reached Peshawar Saddar and one Aqua was selected. Rate almost finalised. Suddenly my eyes were attracted by a car parked behind another Aqua. I was told that it is Honda Fit Hybrid 2013. I requested them to show me that. I invested 10 mins in inspecting, driving and comparing with Aqua. I was so delighted and thankful to Allah that I saw this car before getting Aqua. I finalised the deal. Although it was costlier than Aqua but it is worth it. 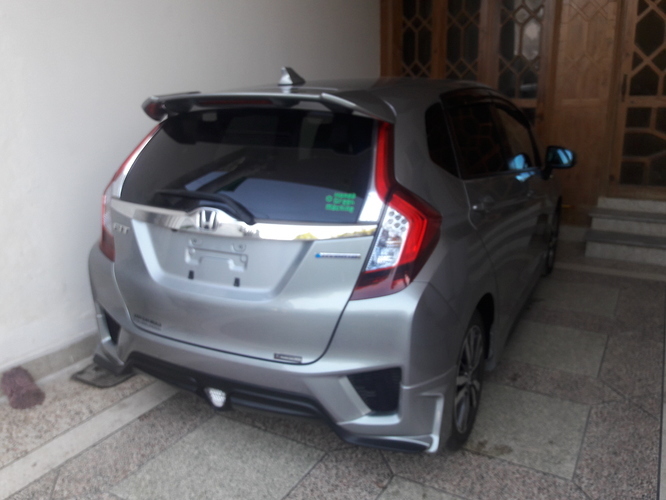 It is Honda Fit 2013 New shape. This is version 3 or GP5. Hybrid. Auction grade 4.5. Cruise Control, Pedal Shifters. Alloy Rims with low profile tyres. It had Gathers Vezel Mode replaced. I enjoyed the test drive. Will share further experience. But highly recommended to car lovers. Looks bigger than Vitz 2005-6 buy very huge from inside. Soundless drive. A big car inside. Had my first travel. Peshawar to Islamabad on motorway and then to Gujrat through GT Road. Oh my God what a pleasure and journey experience. The car is a pleasure ride. Overall 20 Km/litre. Great pick, great cooling and controlled ride. Cruise control was also impressive. I got it for 20 lakh and has now applied for registration. People are are lying about their Honda Fit grades. 1st is Baaic Package; then is F Grade which has nothing on steering wheel, then is L Grade which has multimedia buttons on steering including Cruise Button, then top of the line is S, also known as RS which has Triptonic or manual gears on rear of steering written as + and - on them. Triptonic also known as Pedal Shifters. This is the latest model. No not expensive. Actually the shape changed in 2013 September. This is new shape and S package. I was also getting a F Version 4 grade in 18. But the feeling Me and my family got while sitting in this S package was far superior than that F grade. Congratulations. Very nice car. I have the L version and it is indeed a lovely machine. Then stop, put the car in S mode and flick the up shift pedal and see that the car comes down to 2m. Got Islamabad Registration. Cost is Rs 49000 in total for an Islamabad resident. It includes late fee and I'm a filer also. Can you please share the media system you have got in your car. I mean the Gather model number. What is the standard media system installed in Honda Fit 2013 ? ?